Rainbow Six Siege players who log onto the game before January 1st will be rewarded with a free random player character or “operator” from one of the game’s DLCs, Ubisoft announced on Monday. Players can also receive 25,000 renown (which is Siege’s in-game currency) if they already have all the DLC operators. 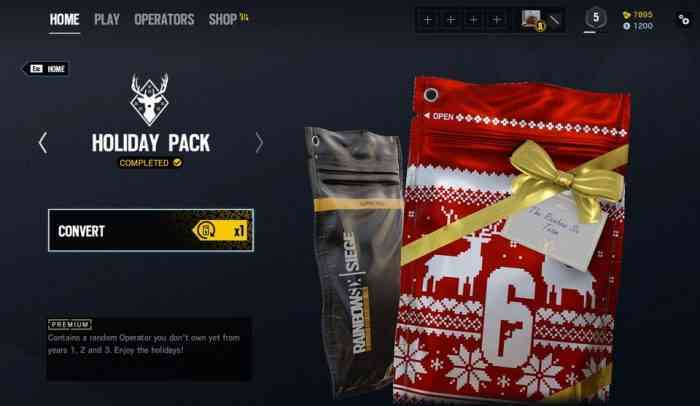 This “Holiday Pack” has a random operator from Siege’s Year 1, 2, and 3 content packs. This means that even relatively recent operators such as Alibi could be obtained for free. However, those who own all the operators should be aware of that there’s a glitch with the pack that can cause them to not be able to receive their 25,000 renown. On Monday, Ubisoft stated that they’re “investigating” this issue and will provide an update when any new info comes up. What do you think of this news? Let us know your thoughts in the comments section below the article.